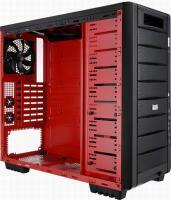 Today we are going to take a look at a new case from AZZA, the new Helios 910R Mid-Tower case. This is the second case we've taken a look at from AZZA, a few months back we had the chance to check out the AZZA Solano 1000 Mid-Tower case (full review here) and overall we were very happy with it. 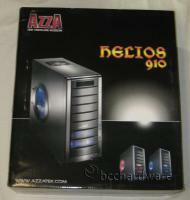 The AZZA Helios 910R is aimed at the budget market and carries of a MSRP of under $100.00 CAD. 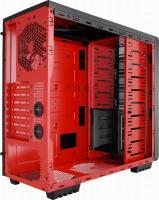 At the time of publishing we found this case online for $66.99 CAD ($91.99 - $25.00 Manufacturers Mail-in Rebate) which makes it very affordable for the gamer on a budget who still wants a nice looking case. 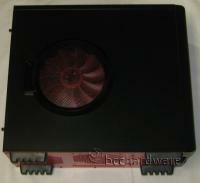 The Helios 910R does not come with a power supply. 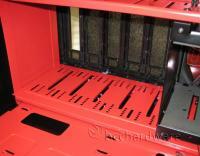 As soon as you take the side panel off the AZZA Helios 910R you'll notice that it's red.....very very red. 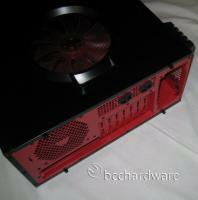 At first I was a little surprised at just how red it actually was (everything inside is painted red), however after a bit it kinda grew on me and it definitely makes this case unique and sets it apart from most other "budget" cases which are traditionally all back with a silver inside. All of the hard drive bays (5 1/4 Bays) are mesh which allows for extra airflow which is always nice to have (pictured below, left).